Basins These reservoirs make it easy to install a formal spillway, basalt column or disappearing fountain of your choice. Designed to take the guesswork out of installing fountain rocks, hand-carved stone, brass fountains, and bubbling urns. Designed to provide a trouble-free, easy-to-install fountain basin for a wide variety of decorative water feature installations, including natural stone, brass and resin fountains. Its innovative design provides water feature owners and installers with features and benefits that eliminate guesswork, improve water circulation, increase accessibility and ensure a lifetime of enjoyment. Large corner pump access panel simplifies pump access, fits larger pumps and sits elevated above the deck, preventing gravel from falling into the basin when removing the lid. Square shape maximizes water storage capacity. Protects pump and reduces maintenance. Fountain basins provide concealed water storage and support for decorative water features. Atlantic Fountain Basins are the easiest way to add a water feature to your landscape even for the novice installer. Quickly installed at, above or below grade in landscapes or hardscapes. Designed to take the guesswork out of installing fountain rocks, hand-carved stone, brass fountains, and bubbling urns. The AquaBasin is a great way for anyone to quickly and easily install these popular styles of water features. Can accommodate all Ultra Pumps. Aquascape AquaBasin Mini makes it simple to have a water feature in almost any setting. Can accommodate pumps up to 350 GPH. 24" x 24" x 16"
Ideal for small statues, vases or rocks where splash is minimal. Has the thickest, strongest grating of any similar product. Roto-molded for superior strength. Pump access door for easy pump removal and cleaning. 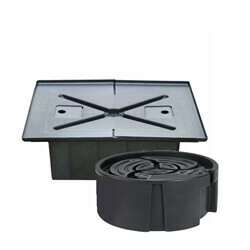 The ideal in-ground water collection reservoir for fountains, ornaments and small preformed pondless waterfall systems. The Pondmaster Fountain Basin is easy-to-install and can be used for a wide variety of decorative water feature installations, including natural stone and resin fountains. Its innovative design provides features and benefits that eliminate guesswork, increase accessibility and ensure a years of enjoyment. 2' x 2' x 10"
Enhance your landscape with a decorative disappearing water feature using the OASE PondLess Basin. Ideal for pondless displays, this basin has a 2-piece thermoformed construction that provides remarkable durability. Deep, recessed channels allow tubing to be placed safely and securely on top of the basin. The molded interior features an easy access pump chamber. The basin can support decorative features up to 250 lbs. The overall robust design simplifies above ground or buried and concealed installations. It is 24" x 24" x 12.5", supports a maximum flow rate of 800 GPH and a plumbing size of 3/4". With the OASE PondLess Basin, a variety of water features can be created. Quickly and easy installation above ground or buried and concealed. Support decorative water features up to 250 lbs. Dimensions: 24" x 24" x 12.5"
24" x 24" x 12.5"